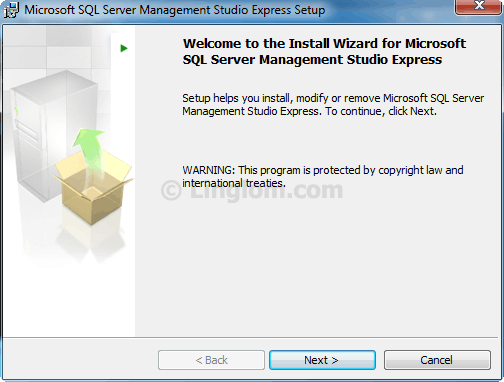 Note: This article is applied on installing Microsoft SQL Server Management Studio Express which is used for manage Microsoft SQL Server 2005 Express only. The installer has encountered an unexpected error installing this package. This may indicate a problem with this package. The error code is 29506. 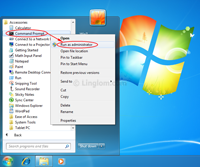 This error message relates with permission issue (UAC) on Windows Vista and Windows 7. To solve this problem, you have to re-run the installer again using elevated command prompt by run the command prompt as administrator and execute the installer in there. 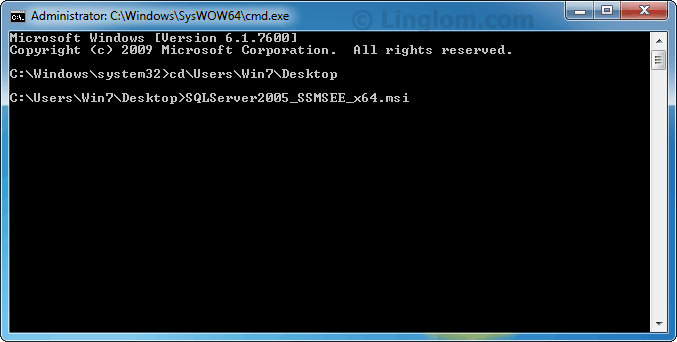 If you are using 64-bit Windows, you should use the command prompt at C:\Windows\SysWOW64\cmd.exe instead. Otherwise, you can use the command prompt at C:\Windows\System32\cmd.exe. 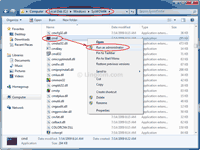 You will see the step-by-step guide to use elevated command prompt to execute the installer file on the section below. The other solution, you can disable UAC on Windows but I don’t recommend it since it will lower your security system. Run elevated command prompt by right-click on Command Prompt in Start -> All Programs -> Accessories -> Command Prompt and select Run as administrator. Note: This step is for 32-bit Windows. If you are using 64-bit Windows, see the next step. If you are using 64-bit Windows, you have to run the command prompt in C:\Windows\SysWOW64. Right-click on cmd.exe and select Run as administrator. 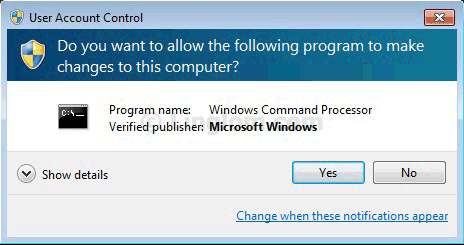 On User Account Control, click Yes. 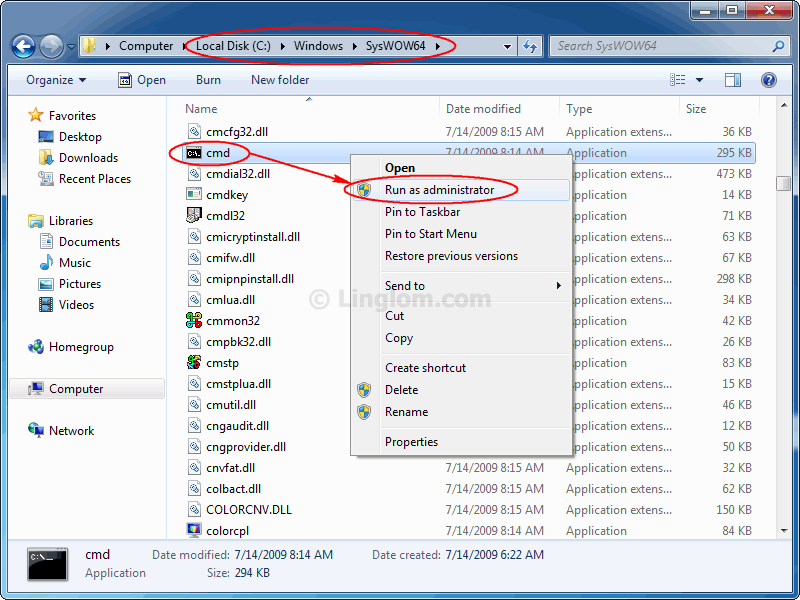 On Command Prompt (both 32-bit and 64-bit Windows), change path to directory where the installer file is and execute the file. By default, the file name for 32-bit version is SQLServer2005_SSMSEE.msi and 64-bit version is SQLServer2005_SSMSEE_x64.msi. On Setup Wizard, follow the instruction as usual. There won’t be the error message this time. Thank you for this tip, it worked like charm! Thz for this solution.It’s powerfull. Very very thanks for this. Its work for me after a lot of fighting to install the SQLServer2005_SSMSEE.msi. Thanks for tutorial, Lol, I couldn’t find any that were decent or that made any sense. Thanks a lot. Came in handy. I followed the steps starting with step 2. I am running Windows7 Professional on a 64 bit operating system. 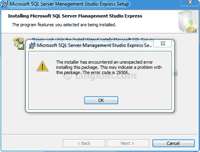 I am getting the error message each time I try to run the installer. I was logged in as Administrator from the beginning. Thanks a million. that was really helpful. Was trying for 2 weeks! i tried what you mention in above and install successfully. But when i trying to run that time server name is not showing(empty) then i put my system name and system name\sql express BUT NOT CONNECTING. 2 time i uninstall and install but same problem is showing pl z tell me solution Thank you! Muy buen tip amigo, muchisimas gracias. Wielkie dziÄ™ki! Great thanks. Second week oneself I from this tired. Thanks a lot. Your post saved me a lot of time. I hate when Microsoft products don’t work or even install under Microsoft OS. Thanks! Saved a lot of frustration! Excelent … well done !!! but when I go back i can’t find the features that should be selected. by the way I am using windows 7 ultimate 32-bit operating system. buy the way Iam using windows ultimate 32-bit operating system. – it’s good fix, thank you. 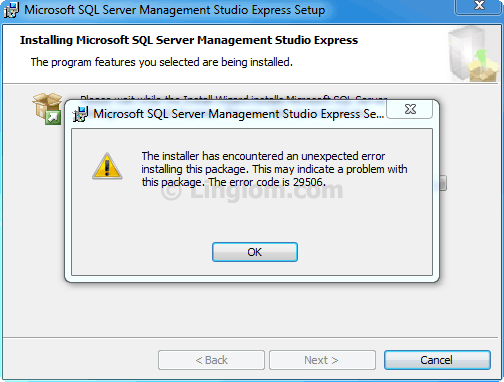 sql server is opening and shortly closing immediately…. Thank you sir…it’s very helpfull..
You saved my live, thanks!!!!!!!!! vocÃª e zika cara VLLLLLW! Thanks its works perfectly. I was just stuck at the problem. I am using win 7. Thanks a lot sir !!! It works…. Thanks a lot! Worked great on my W7 x64 PC. Thank you !!!! its working 100% on my W7 x64 PC. Thanx for who ever post it its works me alot……. It work thru the cmd.exe! Work for me too !! It’s working fine for me. I can install and open it on Windows 10. I suggest you try to re-download the file again. Is there any error message? Which step did you have trouble? Did you mean that you can’t change path to folder where the setup file is? What’s the error? Can you try to move (or copy) the setup file to the path (c:\Windows\system32) so you don’t have to change path on cmd.exe? Very very thanks for this error solution. Its work for me after a lot of fighting to install the SQLServer2005_SSMSEE.msi. really I would like say to you thank you!!!!!!!!!!!! Thanks a lot.. Its superb and directly to the point. Thanks a million… It worked…. 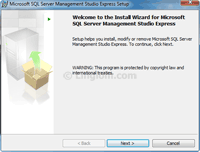 step 2 : right click SQLServer2005_SSMSEE_x64.msi and instal with Revo Uninstaller.